Peterhead Harbour CEO Ian Laidlaw with Scottish Secretary David Mundell at Peterhead fish market in June 2017. The responsibility to fight for better fishing rights for the UK after Brexit will be “enshrined in law” under new proposals tabled by the Scottish Secretary. 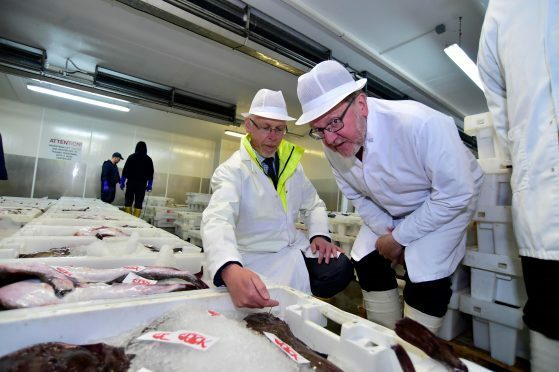 David Mundell issued a “watertight commitment” to the sector last night, ahead of his visit to Peterhead fish market today. He has also pledged a £37 million funding package – with Scotland entitled to almost half – to help ease the transition when the country leaves the European Union. Under the planned changes to the UK Government’s Fisheries Bill, ministers will be legally obliged to fight for a better share of fishing opportunities than the current Common Fisheries Policy deal. Between 2012 and 2016, EU members netted an average of £540m of fish from UK waters every year. By comparison, British boats in EU territories caught around £110m every year. The new move will “enshrine in law” the UK Government’s commitment to pursuing a fairer deal and Mr Mundell described it as “great news” for the industry as it readies itself for life as an independent coastal state. “It is absolutely essential Brexit delivers for Scottish fishermen and for those in the rest of the UK,” he said. “It is clear they want to leave the Common Fisheries Policy and do not want any future deal with the EU to link access to our fishing grounds to our access to European markets. In addition to the legal changes, the Scottish Secretary is pledging an extra £37.2m for the fishing industry – of which Scotland will be entitled to £16.4m. This will be issued in conjunction with the current European Maritime and Fisheries Fund (EMFF), which will be replaced by four comparable schemes in 2021. Environment Secretary Michael Gove said: “We are taking back control of our waters and will secure a fairer share of fishing opportunities for the whole of the UK fishing industry as we leave the EU. The announcement was welcomed by the fishing industry last night. A spokesman for sector body The Scottish Fishermen’s Federation (SFF) said: “Particularly pleasing is the rejection of French President Emmanuel Macron’s suggestion that existing shares of fish be maintained post-Brexit and the establishment instead of a platform for annual negotiations to move towards much fairer shares. “The industry remains adamant that there must be no link between access to UK waters and trade with the EU.